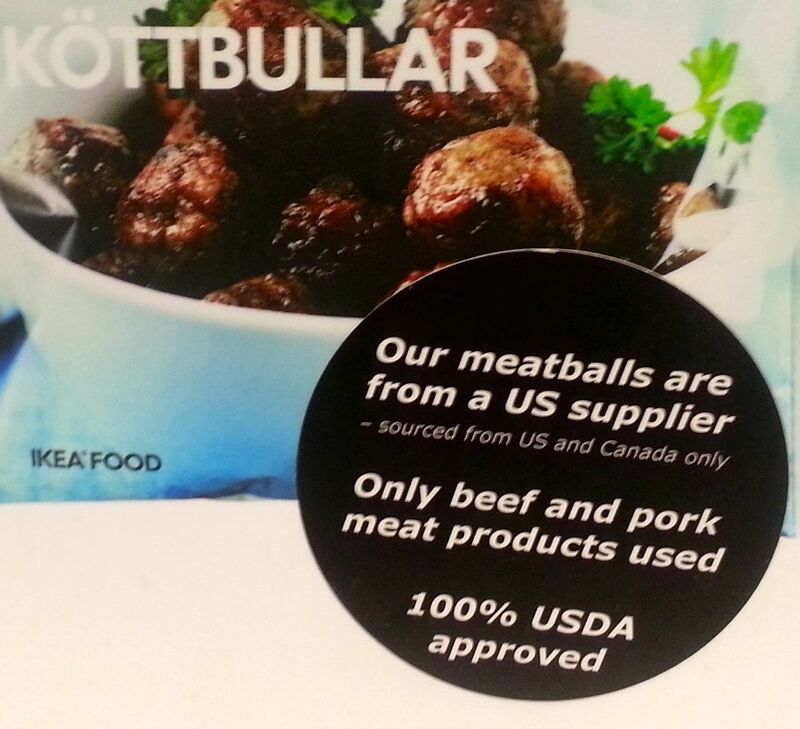 My husband and I drove over to the IKEA in Burbank a few days ago mainly to eat meatballs. We ended up shopping afterwards and spending more than we planned, but that's not the point of this post. There are several items on the IKEA menu that I find tempting, such as the crepes, the ribs, and the new Spinach Salmon Lasagna, but we always order meatballs. It's the classic Swedish flavor that keeps us coming back. The price doesn't hurt either. For only $5 you get 15 meatballs, a scoop of potatoes, lingonberries and cream sauce. For only $1 you can add 5 meatballs to any entree. My husband likes the meatballs so much that he added 5 to his meatball entree. I'd never expect to like any sort of berries with potatoes and meatballs. I usually don't like sweet fruit flavor with meat, but this is an exception. The flavor works so well that I make a point of having lingonberries, potatoes and a meatball in every bite. I like the lingonberries so much that I buy jars of it at the marketplace so that I can eat it at home. It's great as a topping on pancakes made from IKEA's pancake mix too (also sold in the cafe). My husband also got a piece of Almond Cake for dessert. It had an almond and graham crackerish crust topped with some sort of sweet cream or whipped cream and chocolate. It's really sweet but not too sweet. He wasn't disappointed with it, but he said he'd probably try something else next time. Yesterday my husband and I returned in IKEA to pick up some more home decor that we decided we needed. Of course, we stopped by the cafe again. 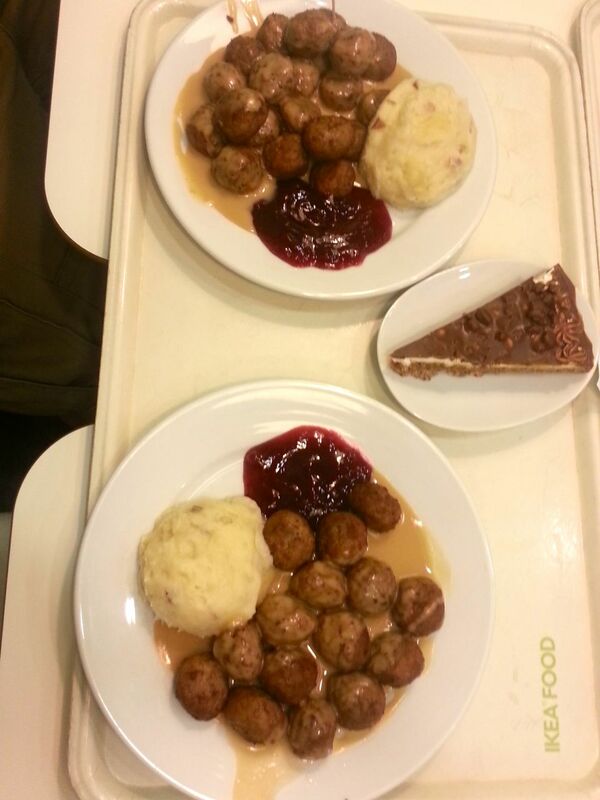 Since we had been to IKEA only a few days earlier, we decided to branch out and try something besides the meatballs. We were feeling adventurous (and hungry) so we ordered 3 meals (one each and one to share) and 2 desserts. 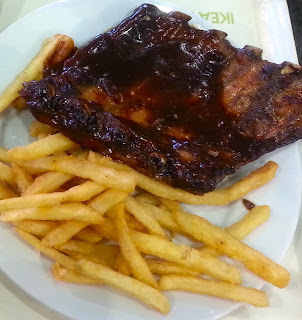 My husband got the BBQ Baby Back Ribs which came with fries and cornbread. He really, really liked them. He said that if we were trying to decide where to go for ribs and if the decision were between IKEA and Stonefire Grill, he'd definitely pick IKEA. (Click here to view my review of Stonefire Grill.) He said on a scale of 1 to 10, 10 being great, Stonefire Grill's ribs were about a 4, and IKEA's ribs were about an 8. Wow. He was just rating the ribs based on taste, but for the price (only $7.99), you can't go wrong. He said that if we were trying to decide where to go to eat to get ribs, and if the choice were between IKEA and Woodranch, it would be a tough choice (based on taste), but based on price, IKEA would probably win. I have to say that I was surprised just how much he loved the ribs. He didn't leave a bite for me to taste, so I can't really give my opinion. My husband's from Texas, so he knows good ribs when he tastes them. IKEA, I'm impressed. I got the Organic Mushroom and Cheese Crepes. 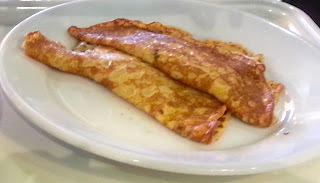 The crepes tasted just like they do when I make them from the pancake mix you can buy in the IKEA market. They were stuffed with mushrooms in a cream sauce. I didn't really taste cheese. It tasted kind of like cream of mushroom soup inside crepes. It wasn't bad. I'd never think of putting those flavors together, but it was enjoyable. I'd get them again. They're only $2.99. It's a nice light lunch. 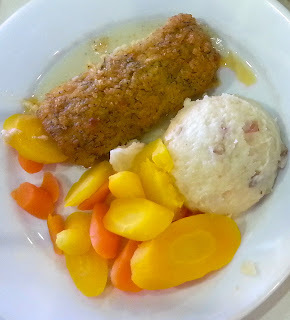 We wanted to share the Salmon Lasagna, but they were all out, so we shared the Saithe Herb Crusted Fish, which came with mashed potatoes and carrots. I don't like carrots, so I didn't taste those, but the potatoes were good; they're the same ones you get with the meatballs. It was actually kind of weird eating them without the accompanying lingonberry sauce that comes without the meatballs. The fish was really good. I don't know that it's better than frozen fish you get at the grocery store and reheat, but I'd get it again. It was a lightly battered flaky whitefish. We shared two desserts. 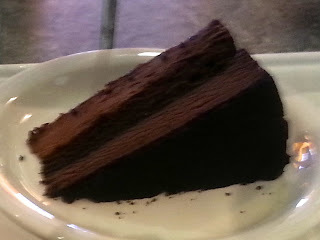 My favorite was the Chocolate Overload Cake. I've had it before, and it's amazing. It has a layer of chocolate cake topped with a layer of chocolate mousse, topped with a layer of chocolate cake, topped with a layer of chocolate mousse, topped with chocolate ganache and chocolate swirls. It's very rich and definitely satisfies a sweet tooth. I don't know that I could handle eating more than half of it at a time because it's so sweet. It's great to share. We also tried the Swedish Apple Cake with Vanilla Sauce. It kind of tasted like a cold version of McDonald's apple pie. 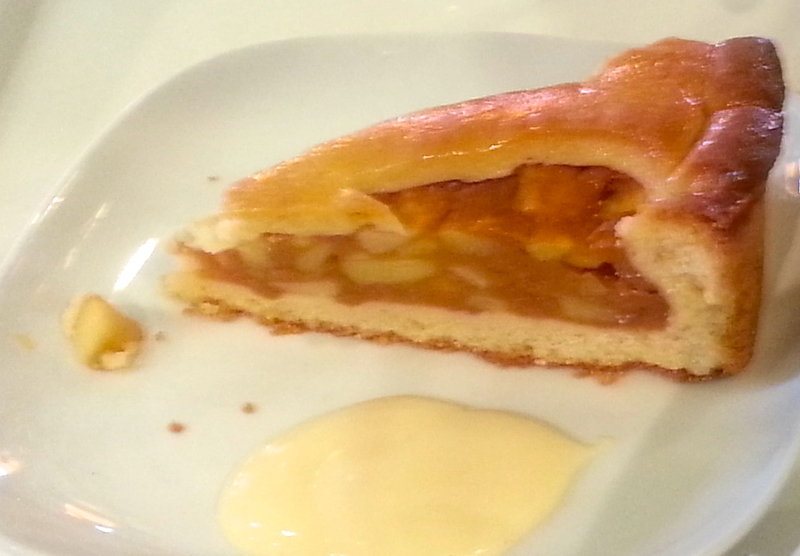 I really love apple pie and apple cake, but this wasn't my favorite. I probably would've liked it more if it had been warm or contained more cinnamon. It was okay, but if I were going to get dessert next time, I'd stick with the Chocolate Overload Cake. In short, don't miss eating at Sweden's best international furniture store. If I lived in Burbank, I'd eat at IKEA a lot more.